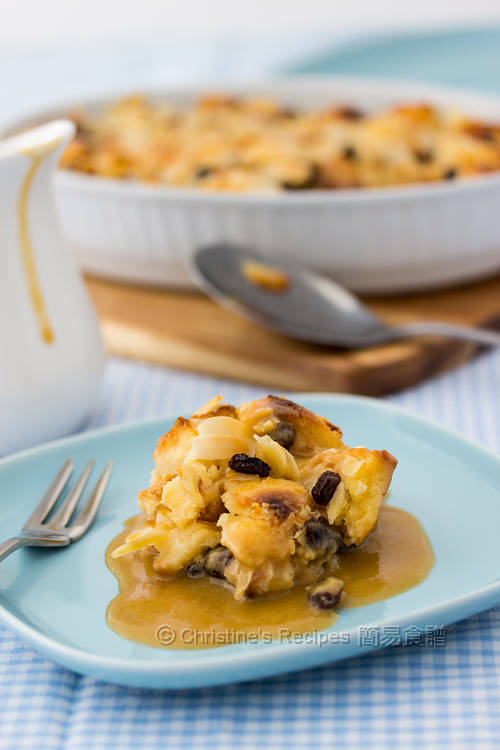 Making bread pudding is a good way to get rid of any stale bread. 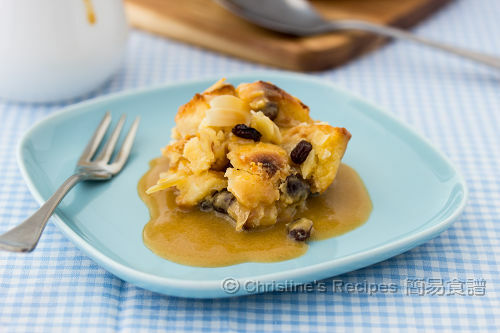 Not many people like eating stale bread, yet many people will surely want to taste the bread pudding. I made some for a small group gathering the other day. Everyone could taste a piece with the yummy sauce. The caramel sauce is loaded with rich sugar cane flavour, definitely naughty and good. The only complaint that I received was the portion was too small. I need to make more next time. Cut the bread into 3-cm cubes. Grease the baking tray with butter. Set aside. In a saucepan, heat milk over medium heat. Add sugar and salt. Cook until the sugar completely dissolved. Don’t need to bring it to boil though. Remove from heat. Add whisked egg. Stir in cinnamon and vanilla extract. Preheat oven to 170C / 350F. Place the bread cubes in a large mixing bowl. 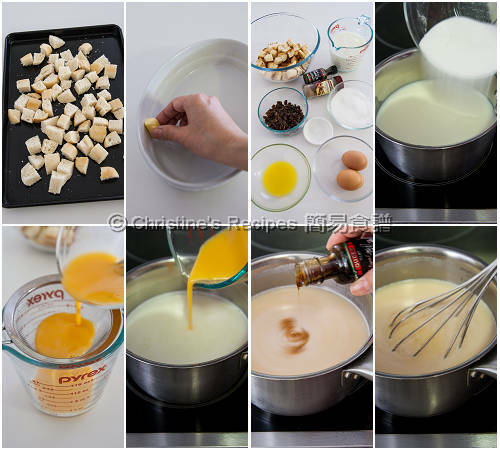 Pour half of the milk mixture into it and mix well. Let it stand for 15 to 20 minutes. Stir to mix again in the middle to let all bread cubes absorb the milk mixture well. Transfer to the greased baking tray. Sprinkle raisins. Pour the remaining milk mixture. Sprinkle almond flakes on top. Bake in the preheated oven for 40 to 45 minutes. When the pudding pulls away from the edge of the tray, it’s done. While baking, prepare the sauce. Put butter and light brown sugar in a small saucepan. Heat over medium heat until the sugar is completely dissolved. Bring it to a boil. 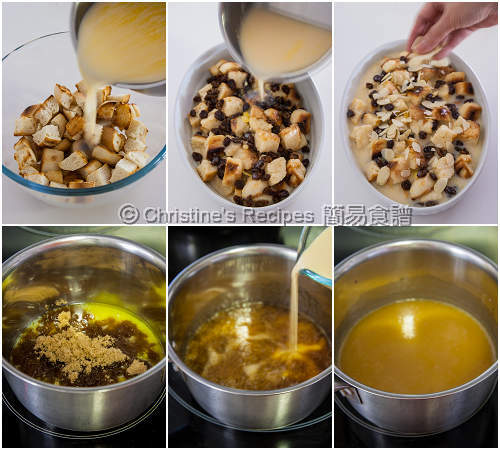 Pour evaporated milk and mix well. Serve the pudding with caramel sauce on the side. Pour on to taste. You might use fresh bread too. Simply bake the bread cubes in a preheated oven at 170C / 350F for about 8 to 10 minutes until they become dry and crispy. Turn once after baking 5 minutes. I used dinner rolls from a supermarket. The end result was satisfied. 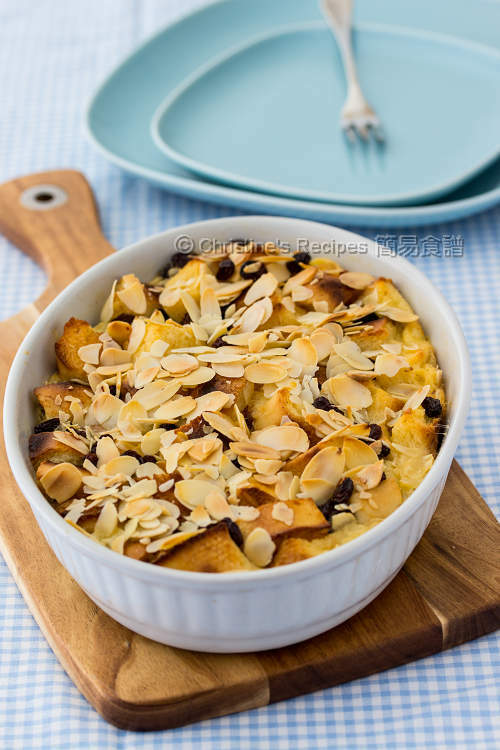 Soak the raisins in hot water for about 10 minutes and wipe dry before use. Can I use normal gardenia bread? Most importantly, use dry and stale bread. Otherwise the pudding texture will be quite mushy. Yes, you can, as long as the old batch of tangzhong hasn't turned bad. Btw, please post your comment below the relevant post. Then other readers would know what we are talking about. Hi Christine, i tried to post right below relevant recipes but new comments are not accepted due to overload of comments. Btw, does it make any difference between adding melted butter and soften butter to flour mixture in the bread machine pls? TQ. If too many comments, the page will load too slow. Sorry for the inconvenience. Please keep posting below the relevant bread making recipes. Back to your question, it’s no difference in between adding melted butter and softened butter.